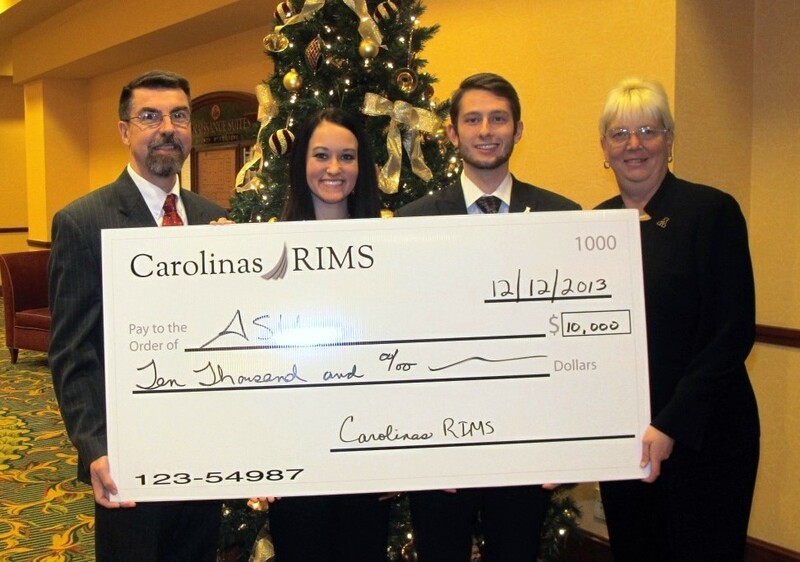 The Board of Directors for Carolinas RIMS presented a $10,000 check to students from the Appalachian State University Risk Management & Insurance (RMI) program at their December 2013 Holiday Social in Charlotte. Present to accept the check from Appalachian State were Dr. Karen Epermanis, Greg Langdon, along with Gamma Iota Sigma Rho President Alyssa Bouchard and VP of Public Relations Wes McDaniel. RIMS Chapter President Karen Mouton presented the ceremonial check to the students at the Holiday Social. Carolinas RIMS annually sponsors a Shadow Day where RMI majors from Appalachian State spend the day learning from industry professionals. They also provide scholarship assistance to AppState RMI students, and sponsor students to participate in the Southeastern Regional Educational Conference.